This post is sponsored by Little Black Dress. The LBD, there really isn't much to it, it's just a little black dress. But what happens when you pair it with different accessories? I think styling dresses differently can be quite challenging, often I find that once I've worn a dress for the first time I don't really know how to wear it again without it being really obvious that I've already worn it before (not that there's anything wrong with re-wearing outfits but you know when you went to a party last weekend and this weekend you want to wear that dress again but don't want everyone to notice.. yeah, that.) So I thought I'd share with you three different ways you can style one dress. My LBD of choice is a gorgeous velvet wrap dress which is just so perfect for this time of year. 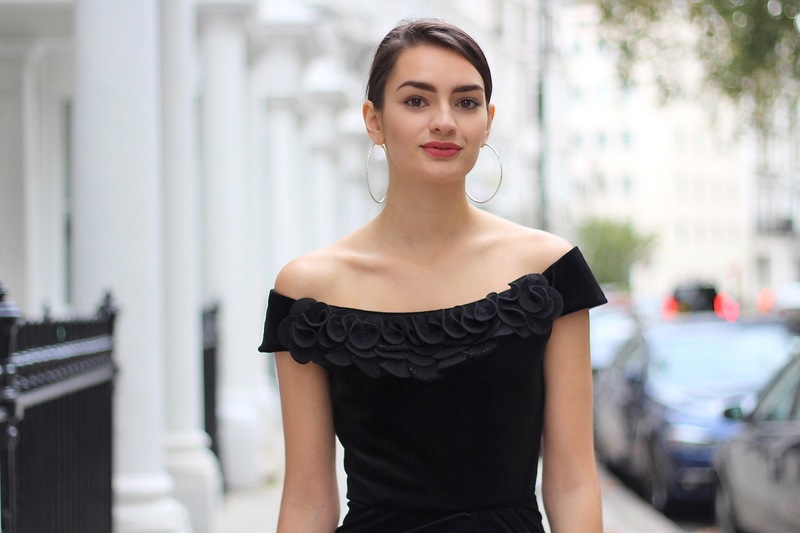 When choosing a dress, I didn't want to chicken out and pick a super plain one; this dress is velvet, has a slit on one side, sits off the shoulder and has appliqué detailing over the bust - with this much going on already, how can you style it differently each time without going completely overboard? For my first look I left it pretty simple, you know the drill, you're going out so you grab your heels, a coat and a clutch, and you're ready to go. I'm assuming this is how we all style our LBDs? 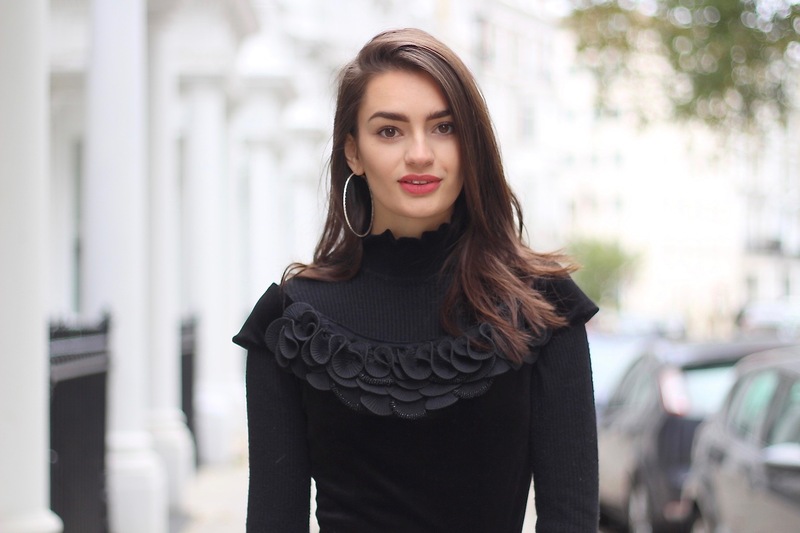 My second look is probably my favourite, and the most daring, I decided to layer a roll neck because I've been loving layering this season and I absolutely love the result. I went for a black roll neck top rather than a coloured one purely because there is already so much going on with this dress but I think it's a really great workwear outfit. If you're going to work and then heading out I think this ensemble gives you the ultimate sophisticated look. For a night out you can simply take off the roll neck or just leave your bag behind and you're good to go. Finally, I wanted to dress it down completely. It's pretty hard to dress down a tight midi dress though so I didn't want to hide the dress completely. I decided to go for my leather jacket which is the ultimate casual outer layer and some floral ankle boots. I think wearing flats can maybe look a bit too much like you've just come back from a night out and your feet are killing, with ankle boots that doesn't happen and it just looks like you've gone for a casual look, great for a day out in town followed by some drinks. Want to know how you could win your LBD of choice, and so much more? Little Black Dress are currently running a competition where you and 3 friends could win the best night ever, worth over £3,000! You'll be pampered before your night out with a hair styling session, dresses from LBD and accessories to match, followed by a three course meal, cocktails and an exclusive free club membership! Topped off with an overnight stay in a London hotel. To enter, all you have to do is share a photo wearing your little black dress on Instagram using the hashtag #MyLBDStory and don't forget to share why your LBD is important to you in the caption. You can read more about the competition here. You look beautiful, love these photos. Those floral boots are so fab!